You only get one body, so it is important to take care of it. That’s why you do your best to eat lots of veggies, get enough exercise, and visit your physician every year for a checkup. But there might be an aspect of your health that you don’t look after the way you should — your oral health. Here are six big reasons why you shouldn’t neglect regular visits to your dentist. It’s recommended that adults get screened for oral cancer at least once a year. Most dentists include a screening as part of a regular checkup. With a quick and painless tactile and visual examination, they can look for any signs of trouble, such as strange sores, patches of discoloration, swelling, and other potential symptoms of oral cancer. If they notice any suspicious spots, they’ll recommend that you visit your physician for further testing. Oral cancer isn’t the only major health concern that presents symptoms around the mouth. A dentist may notice swollen lymph nodes just below your jaw. This is a subtle sign of many serious diseases, such as different types of cancer and infections. If your dental care provider notices that there may be a problem, you can visit your medical doctor to discover the cause behind the swollen lymph nodes. Plaque and tartar, which develop when bacteria in the mouth interact with sugar, can quickly lead to cavities. If a cavity goes untreated for long enough, it may cause severe pain and lead to the need for major dental work — it could even result in tooth loss. Regular checkups let your dentist identify tooth decay well before it causes you significant problems. There are lots of bad habits that can damage your oral health, including poor oral hygiene practices, tobacco use, and overconsumption of sugar. 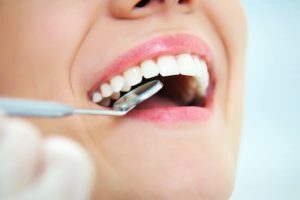 Your dentist can alert you to exactly how these habits are affecting your teeth and gums and give you personalized advice on how to adjust your lifestyle for a healthier smile. Some dental problems, such as new infections and impacted wisdom teeth, don’t present obvious symptoms right away. A dental X-ray looks below the surface and lets your dentist get a comprehensive look at your teeth and the surrounding structures. When was the last time you visited your dentist? If the answer is anything longer than six months ago, please schedule a checkup. Your smile — and perhaps the rest of your body — will thank you! Dr. Robert Long grew up in Cleburne and loves to serve the community where he was raised. He is a highly respected dentist who takes pride in helping his patients care for their teeth and gums. If you would like to ask him questions about your oral health or schedule a checkup, please contact one of our offices.